Last year I wrote an Instagram Guide to Newcastle, a little collection of my favourite places to take photographs around the Toon. It wasn't the easiest post to write - in a city far from the Instagram obsessed London you wont really find people queuing around the block for pictures outside a cupcake shop, posing for photographs outside pink houses or ordering lattes for their artwork. For a long time, here in Newcastle we've been pretty chilled when it comes to all things Instagram. Until now! 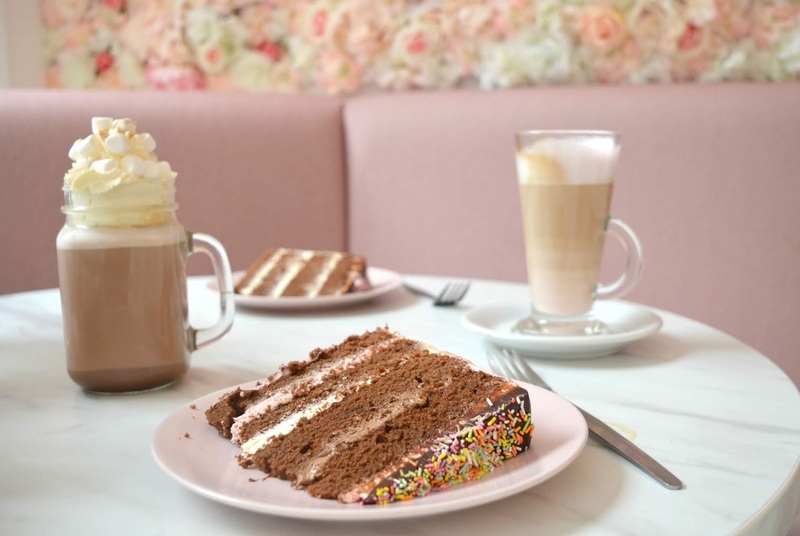 Suddenly Newcastle has its very own Instagram Hot Spot complete with flower walls and pink lattes. 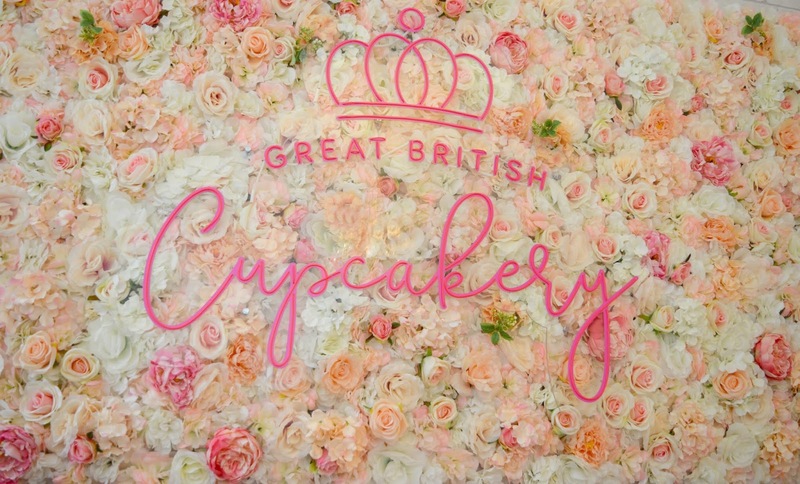 Welcome to the new look Great British Cupcakery! 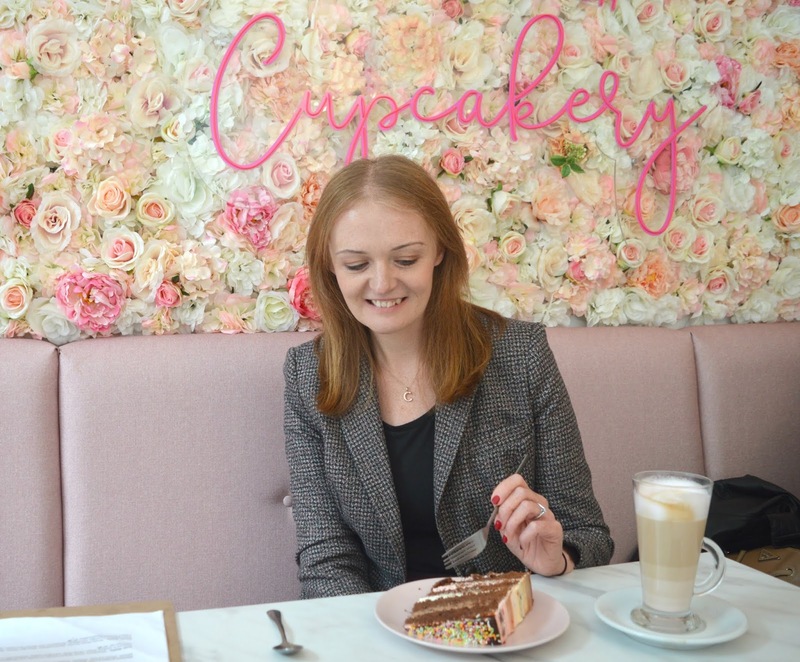 The Great British Cupcakery isn't new to Newcastle (they actually launched their little parlour on the Quayside the same year that I arrived in the Toon!) and for many years it has been the best place in Newcastle to host a baby shower or enjoy a mammoth scone - in fact it was only earlier this year that I wrote a review on their naughty breakfasts! However, recently, something has changed! You see, Great British Cupcakery has had a bit of a makeover, and it's the best makeover I've seen in a long time. Although the parlour wasn't exactly ugly before, it's now become so beautiful it's attracting people from far and wide who want to come and see the new look for themselves. With a strong army of over 34k followers on Instagram, the Great British Cupcakery has become THE place in Newcastle to Instagram! The parlour now pretty much ticks every box when it comes to taking the perfect photograph - flower walls, neon signs, a blossom tree, pink furniture, marble tables. You name it they've got it and although I'm sure some people are rolling their eyes at the very idea I have to say anything that puts Newcastle on the map and encourages people to support a local family business is fine by me! Of course, it doesn't matter how beautiful a place is, the food has to be good as good as the interiors, so I decided to head down for a little nose at their new look and just double check that the cake is as good as I remember. Knowing how busy the place is I managed to convince my lovely friend Sarah to drag herself out of bed on a weekend to ensure we were arriving for opening at 10:00 am (we were the very first people in!) to ensure I could park my bum on a seat before the place got rammed. 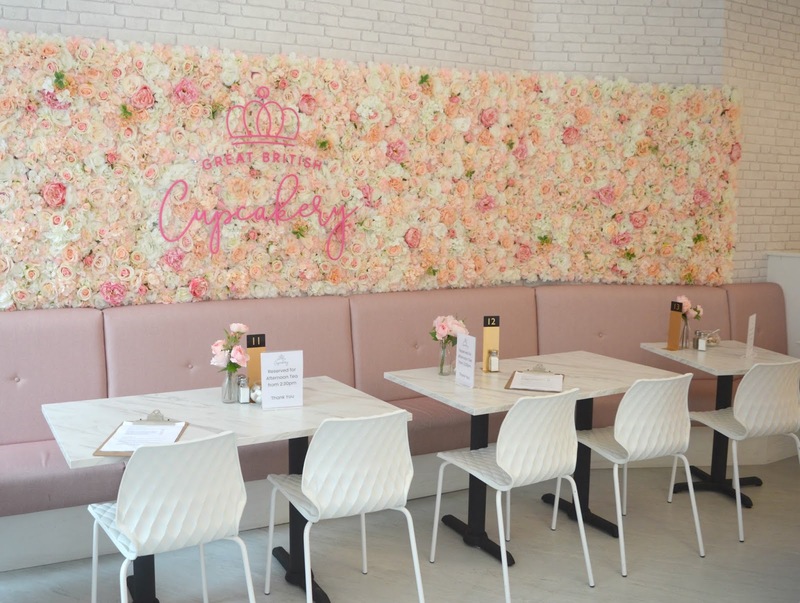 If you've taken a stroll past The Great British Cupcakery recently then you'll know it's pretty hard to get a seat during peak hours with every table being booked up for afternoon teas. After all of the necessary cooing over the beautiful new flower wall (I'm pretty sure every person in Newcastle must have had their photo in front of it by now?) we headed over to the cake counter to choose our treats. As always it was an impossible decision with the most impressive display of layer cakes, rocky roads the size of your head and picture perfect cupcakes (and that's before even opening the menu to peruse the selection of bubble waffles and freak shakes!). Luckily the staff were on hand to offer their favourite picks (I'm always grateful for advice when I'm that stuck). It arrived in two parts, a glass of delicious hot pink milk with a shot of coffee on the side, perfect for me to create my own pink latte with as much caffeine as I wanted. I did, of course, pour the whole little cup of coffee into my drink, at which point suddenly things came a little less Instagram perfect after I spilt quite a bit of it down the side of my glass and onto the perfect marble table. Oooops! Although we'd both been pretty tempted by the Little Mermaid inspired Bubble Waffle (next time!) we both decided to stick with the traditional Great British Cupcakery goodies and got a slice of cake each. My Neapolitan of layered sponges sandwiched with different flavoured butter creams and topped with a very indulgent helping of thick chocolate really hit the spot and although it was very filling I did, of course, manage to finish every last crumb. 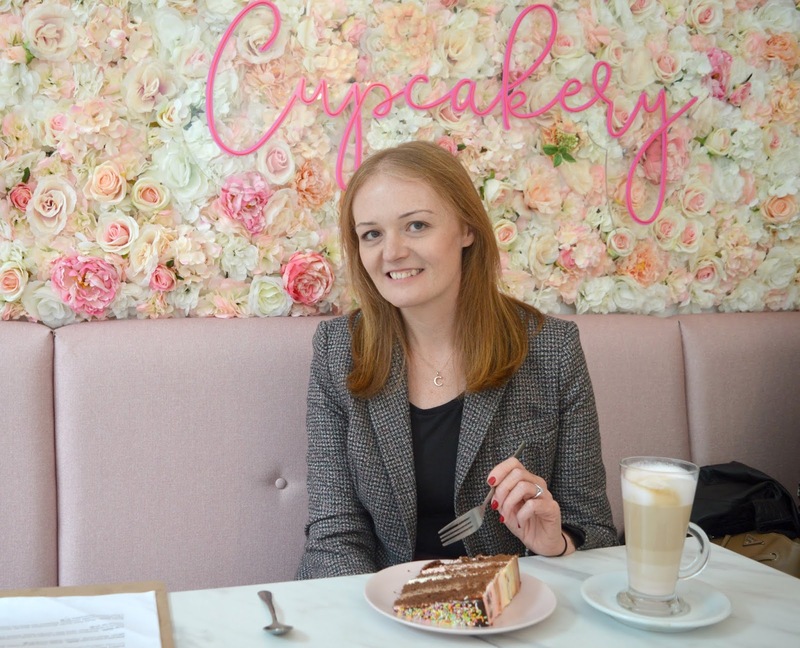 So, it seems that Great British Cupcakery really is Newcastle's best Instagram hot spot, and I tell you something, their cakes are pretty damn good too! Let me know if you've visited and how many photos you've had taken with that flower wall! OMG she'll love it! They do a mermaid bubble waffle and a unicorn geet big shake! I need to revisit this place since it's been done! It looks so different! I'd seen a lot of photographs but I still couldn't get over how great it looked! Haven’t been here for ages, obviously can sense a photo coming on in front of that cute wall! 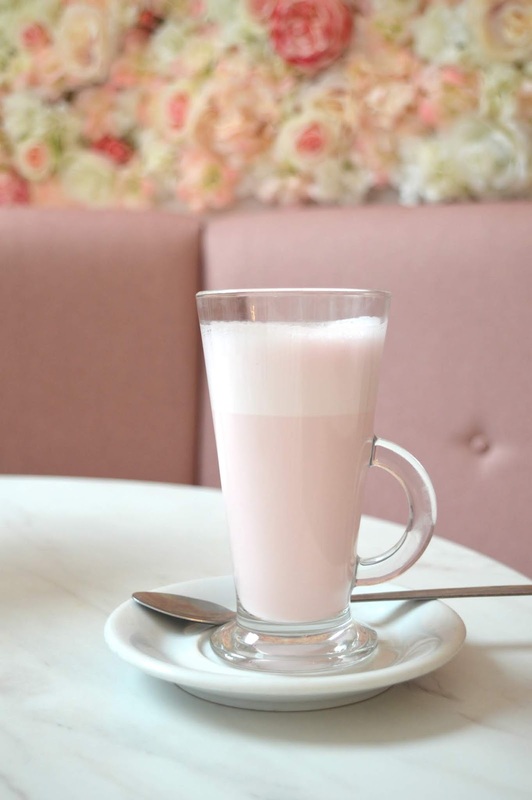 I haven’t got a huge sweet tooth but definitely fancying one of those pink lattes! Thanks for sharing another fab place to go to in the toon. What now? You're not fussed by cake? OMG! I can't even imagine life without cake! NEED to go here! I love all the pink! It's too cute isn't it?! I was there on Saturday and it was lovely! Couldn't get anywhere near the wall though! I was literally in there at 10:00 am, the first customer through the doors just to get my bum down in front of that flower wall! I always want all of the cake! I did exactly the same thing with my Pink Latte! Pleased I'm not the only one haha. I need to go for their waffles and for the cereal killer, they're top of my list now! I am so clumsy, I really can't be left to pour anything into anywhere! The Cereal Killer does look amazing!